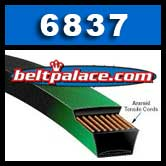 Gates 6837 PoweRated V-Belts. Premium Aramid/Kevlar wrapped "Green" belt. 1/2" x 37" Length. Made specially for demanding lawnn & garden applications or where standard V Belts do not hold up. Classical A35 V belt (non-kevlar). Standar 4L370 V belt (non-kevlar). Replaces OEM GATES 6837 Belt. 4L370 FHP V-Belt. Consumer Brand. 4L370 FHP V-Belt. Consumer Brand. 1/2” W x 37" Length. Replaces Classical A35 V-Belt on light duty applications. BANDO A35KC Ultrapower V Belt. Kevlar Wrap A35 Industrial V-Belt. A35-KC Ultrapower V Belt. Kevlar Wrap A35 Industrial V-Belt. 1/2" Wide, 37” Length OC (889mm). Superior replacement for Standard Raw edge A35, 4L370 FHP V-Belts.